Announcement Check out our website! Love this crop top! Super fast shipping as well. GentleRiot is the best. 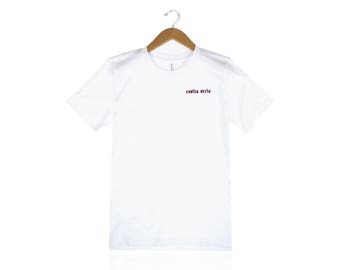 This tee is super cute and fits true to size! I love wearing something created by a Latinx small business. I hope to purchase more Gentle Riot pieces in the future. Gentle Riot is influenced by 90s nostalgia, rap music, and a riot girrl attitude. This is for all the weird girls out there, outside of the mainstream. Those marginalized by their ideas, principles, and bodies. Here is your safe space. L.A. Born, Vegas Raised I am assistant technical designer for a clothing company during the day I wanted some cute tees and figured why not share the love. I am inspired by 90s nostalgia and feminist ideologies.